Have a room that needs a facelift? Interior painting is not limited to just the walls. Repainting ceilings, doors, and trim can transform your living room, bedroom, or any other space. Choosing the right primer and paint is the first step for any painting project. Find which of Woodstock Hardware’s interior primers and paints is right for your project. You will need the following supplies to help you finish your interior painting project, and you can find these supplies at Woodstock Hardware. Check out our Smart Solutions Paint Kits, which include many of the supplies you will need for your project to save time and money. While any room in your home may appear uninteresting and made of plain old walls, it takes just a little imagination to bring it back to life. You will need the following supplies for your interior painting project. Available at Woodstock Hardware! Probably the hardest part of a painting project is getting prepared and ready to paint. Begin by removing as much furniture as possible from the room. Use drop cloths to cover the floor and any remaining furniture. While plastic is ideal for furniture, canvas drop cloths absorb paint, are not slippery, will not move, and can be reused. Because surface dirt can cause poor adhesion, use a light detergent to wash surfaces that are soiled, that are touched often, or that may have any oily residue from cooking. Take care not to leave any residue from the detergent. Ask the folks at Woodstock Hardware about using TSP as a cleaner. You do not need to worry about leaving a residue behind when using this all-purpose, nontoxic cleaner. Next you will have to deal with any stains on the walls or ceiling. Use a liquid detergent to remove as much of the markings left by pens, crayons, and water stains as possible, and wipe with clean water. For any remaining marks, spot prime the affected areas with a stain blocking primer. If you are painting a glossy surface, to ensure proper adhesion sand glossy surfaces with fine sandpaper. Be sure to remove sanding dust. Vacuum surfaces clean and wipe with a tack cloth. You may also use a chemical deglosser if you wish. Then examine floor, wall, and ceiling surfaces for nail holes, cracks, or any other surface imperfections. Use a putty knife to rake out any large plaster cracks or loose particles in your walls and ceilings. Press spackling compound into crevices with a putty knife and smooth until the compound is flush with the surface. To fill opened mitered trim joints and door or window trim that is separated from your wall, press the compound into the crevices and smooth it with your finger. Allow it to dry and then sand lightly. Because patching compound shrinks when it dries, it is often necessary to apply the compound a second time after the first coat has dried. You now need to inspect the room for any loose paint. Use a putty knife to remove any loose or scaling paint. When you remove paint from walls or ceilings, sand paint edges to ensure a smooth surface. This will marry the two levels of paint so the edges will not be noticed when it is repainted. After the preparation has been completed you will need to decide if any of your surfaces require priming. Priming seals the surface and prolongs the wet edge of finished coats, reducing lap marks and ensuring a uniform color and luster. Of course all bare, or unpainted surfaces require priming. 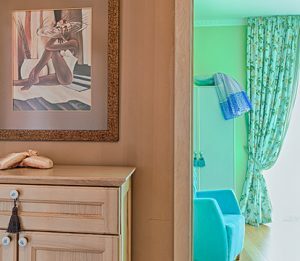 Additionally, any absorbent surfaces, such as wood paneling, or any dark surface that will be repainted with a light color requires priming. There is a common myth that walls that have been painted many times do not need priming, but many layers of latex paint can actually result in a surface that is very absorbent and requires priming. After the primer is dry you are finally ready for the fun part: painting. 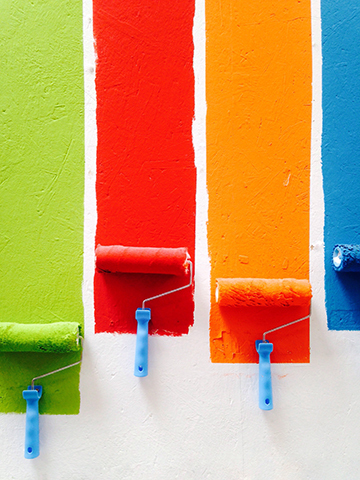 The sequence in which you paint your room can help you work more efficiently. If you are painting the entire room, start with the ceiling and then paint the walls. Start by cutting in. Beginning at the corner of the room, use a sash brush to “cut in,” applying a three-inch strip of coating along the perimeter where the wall and the ceiling meet. Cut in a section at a time, alternating between cutting in and painting the ceiling. This will help maintain a wet edge on both the section being cut in and the rolled ceiling area. It also prevents a visible line between the cut-in area and the rest of the ceiling. You can next roll the ceiling. Before you begin painting your ceiling, cover a roller with paint and slowly roll it back and forth over the ridges in the tray to remove excess paint. Start painting near the corner of the room, blending the coating into the ceiling line painted previously. Paint across the width of the ceiling, rather than the length. Continue painting until your ceiling is covered completely. A recommended tool is an extension pole, preferably adjustable, which allows you to reach your ceiling while keeping your feet on the floor. When you paint, make sure to roll in a motion across your body, rather than along your body, to avoid straining your neck and back. You can now start painting the walls. Once your ceiling is dry, return to the spot where you began painting. Use a trim brush to carefully cut in along the wall-ceiling line. If you are not comfortable cutting in freehand, allow your ceiling to dry and mask off the edge with low-tack painter’s tape. Wait at least 24 hours before applying tape to fresh latex paint to prevent paint from coming off when you remove the tape. Paint along the baseboard and around the door and window trim, one wall at a time. When you paint with a partner, one should cut in while the other follows, applying paint with a roller. Avoid “hat banding” by painting only one wall at a time. Hat banding appears as a stripe around the border of the painted area, and occurs when the paint you cut in dries before the paint you roll on. Begin by lowering the upper part of the window sash and raising the bottom sash out of the way. Use a two-inch sash brush to paint the window sash, then the rails. Be careful to avoid painting the sash tracks. Next, return the upper sash to nearly a closed position and lower the bottom section, again coating the window sash and rails. Complete the window by painting the rails, frame, and sill. Leave the sash open until the paint has fully dried. Remove any paint from your window panes with a razor blade, taking care not to scratch the glass. The recommended tool for work of this kind is an angular sash brush, which is suitable for flat trim work as well. When using more than one can of paint for a particular job, “Boxing” paint ensures color consistency. Boxing paint is the process of combining all the paint you will be using into one large container. This is especially important when painting a large surface area such as a home’s exterior, where even a slight color variation from one can of paint to another is markedly visible. For most interior jobs, an empty 5-gallon container works fine. Simply pour all cans of the same color paint into the large container, and stir to combine. Whether you are mixing 2 or 20 gallons of paint together, the key is to make sure all the paint is combined to ensure a single, uniform color. Once the paint is combined, you can pour it into a smaller can or paint tray for ease of application. To clean your brushes, work solvent into the bristles, squeezing out as much paint and solvent as possible. Repeat until paint disappears from your brush. Rinse your brushes in a clear solvent, then wash in soapy water. Rinse and let dry. Wrap and store in heavy paper. Rollers: Disassemble your roller and submerge the cover in solvent. When most paint has been worked out, wash the cover in mild detergent, and rinse in clear water. – Remove paint from frame and hardware with solvent. Hang roller to dry. Follow the cleaning procedures noted above for alkyd paints, substituting soapy water for paint solvent. Use cans of paint you have until they are nearly empty, reserving a small amount for touch-ups. Be sure to save alkyd products for hazardous waste collection. In most states, latex paint can be disposed with your household trash once it has been dried out in a can. Leave the can lid open to show that the paint has hardened. Recycle your dry, empty containers in your local recycling program. Also consider donating any products you don’t use to a nearby community group or civic organization. Washing Rollers: When most paint has been worked out, wash the cover in mild detergent, and rinse in clear water. The surface you paint must be dry. You should not paint after rains or immediately after pressure washing a surface. Refrain from painting when the temperature drops below 50 degrees. High quality paints may be applied down to 35 degrees F. This is surface temperature and not air temperature. When starting a painting project, begin on the side of the house that will remain in the shade until you finish. Direct sunlight can cause paint to dry too quickly, and can cause lap marks and blistering. With clapboard surfaces, work from side to side. Minimize lap marks by painting four to five boards across the house until you finish. On clapboard siding, begin your painting in the area where two boards overlap. Use the narrow side of the brush and force paint up under the lap. Coat as much of a board as you can comfortably reach, then flip to the wider portion of the brush and coat the surface of the board. When you take a break, wrap your brushes, rollers, and paint trays with plastic to keep paint from hardening or developing a skin. Be sure to replace the lids on any open paint cans. Eliminate excess paint by dragging the heel of the brush occasionally over the lip of the can. This helps prevent paint from building up on the brush heel. Time will Tell – When is it time to repaint the exterior of your home? Most experts would say every five to ten years, depending on the climate and exposure. If you want a more specific answer, look to see if the finish has dulled, or collected a dusting of powdery pigment. Both are telltale signs that it’s time to repaint. 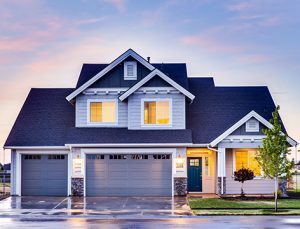 Side by Side – When painting an exterior, work on one side at a time, going through all the steps: scrape, sand or power wash old siding, prime and paint, before moving on to the next side. While it’s tempting to scrape down the whole house once you get started, working one side at a time means your newly cleaned or primed surface gets a quick coat of paint, rather than sitting exposed to the elements. Fall Fever – Spring cleaning often extends to the outside of your home, making spring a favorite time for repainting. But fall is great painting weather as well, and you have a better chance of finding an available painter, if you need to hire help. Optimum painting temperatures are above 50 degrees Fahrenheit and below 90, when weather is dry and there’s no rain in the forecast. Use Caution Around Solvents – If you use rags to apply paint thinner or other solvents, make sure to spread them out on the ground to dry when you’re done. If they’re still wet by the end of the day, soak them in a bucket of water. Solvent-soaked rags can generate enough heat to spontaneously combust if left in a heap without cleaning. Gleaming Gutters – Cleaning leaves out of the gutters is a fall tradition as widespread as raking. While you’re at it, take a moment to repaint stained or rusted gutters as well. Aluminum or galvanized metal, often used to make gutters, is easy to repaint. Just wipe down gutters with a rag soaked in mineral spirits, then clean using a bristle brush and soap and water. Prime the surface with latex galvanized-metal primer (not oil-based) and paint with latex or oil paint. 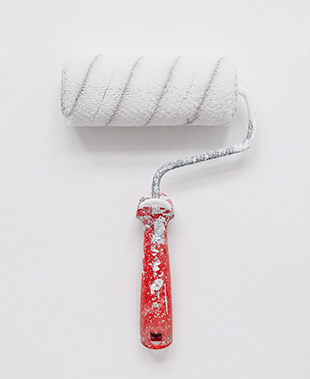 Removing Excess Paint – When painting, dip the brush halfway into paint, then gently tap the bristles against the side of the can or bucket so the brush is loaded but not dripping. Scraping the brush against the side or lip of the can will just scrape all the paint off and leave you dragging bare bristles. Save the Lids – When you’ve finished a paint job, don’t put the lids back on the empty cans. Instead, let them sit open under shelter for a few days, till all residual paint has dried. Then you can dispose of the dry and empty cans in your regular trash. If there is too much leftover paint to air dry, fill the cans with some shredded newspaper or kitty litter to absorb the excess. Paint Earlier Rather Than later – Don’t wait for hairline cracks or flakes to appear before repainting an exterior surface. Once the surface has cracked, moisture can penetrate and cause more of the paint to fail. If you want to know whether your original coat is still in good shape, try applying a strip of duct tape to the paint coat, ripping it off and seeing if any paint comes away.